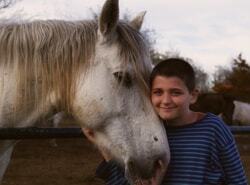 A day at the stables is for children 7 years and above and is from 10 a.m. - 4 p.m. Pupils receive instruction and a ride in the morning and after lunch a further 1 hour ride, as well as meeting all the horses and ponies, grooming, tacking up etc. More experienced riders may ride for longer. 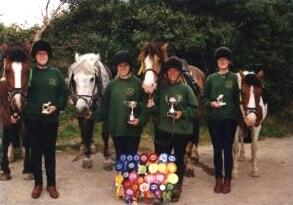 Rosettes for all, packed lunch and warm clothes needed. 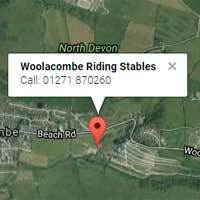 You will find us by taking the A361 from Barnstaple following the signs for Ilfracombe about 8 miles, then turn left for Woolacombe. 3 miles further on the road you will see the village and beach ahead of you. Our lane entrance can be found immediately after the Woolacombe Sands Holiday Park on the left hand side of the road. Drive to the bottom of the lane (Their is a brown tourist sign on your right pointing you to the left saying Woolacombe Riding Stables). 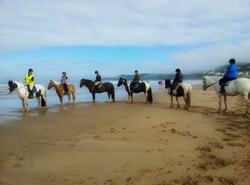 We would like to thank you so much for a wonderful ride on Thursday 15th October. We were made to feel very welcome from the moment we arrived. This was our first time riding with you. We were very impressed by your professional staff who suggested a 30 minute lesson prior to the ride out for Nigel and Hollie who were very nervous as it was only the second time they had sat on a horse! 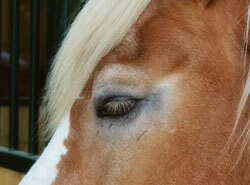 The tuition continued during the ride out making us all feel very well cared for and a definite confidence boost. We had a bit of a scare coming across a dead sheep on the hill, but this was expertly dealt with. We enjoyed ourselves so much thanks to your lovely horses and staff we will be recommending you to all our friends and family. Wishing you all the Best. Hope to see you soon. Kind Regards from Christine, Nigel, Philip and Hollie. 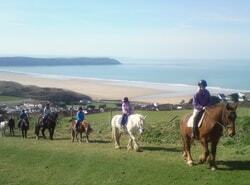 Dear everybody at Woolacombe Riding Stables, Thank you for everything especially for the rides. I think the horse on the front of this postcard looks like Goldie. Thanks for everything again.